“Don’t judge a book by its cover;” likewise, don’t judge a cemetery by it’s grave markers or lack of markers. The best clues are in the card files of the Caretaker’s Cottage. There is something about cemeteries that lends itself to fantastic stories. Over the years a number of these stories about people and events associated with Minneapolis Pioneers and Soldiers Memorial Cemetery have appeared in the major local newspapers. 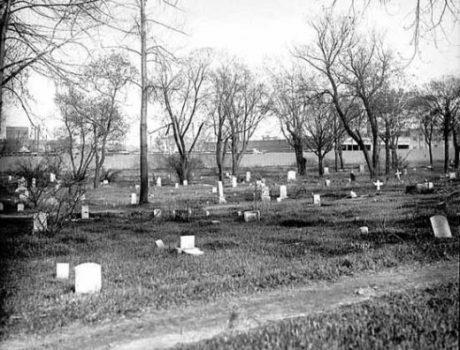 In the late-teens and 1920s, several thousand people were disinterred from the cemetery and reburied elsewhere. The numbers of these removals varied considerably but news stories left the impression that the cemetery was being emptied out. And looks can be deceiving. One hundred years later, passers-by and visitors are likely to estimate the number of burials in the cemetery by the number of marked graves. On the face of it that seems reasonable and might work well in many, if not most, cemeteries, but it doesn’t work for Pioneers and Soldiers where there is only one marker for every ten or eleven burials. There are an estimated 22,000 people remain in the cemetery. “Uncle” Peter Wardell (sometimes Wardwell or Waddell) was the second person buried in the cemetery. Over the years several newspaper articles have claimed that “Uncle” Peter (and it’s usually “Uncle” Peter) was the second– or even the first–person buried in the cemetery. One account said that he was an employee of Martin Layman who had traveled to what was to become Minnesota with members of the Layman family in 1853. Another claims that an unnamed hired man, presumably Uncle Peter, who “about the community from farm to farm” was the first person buried in the cemetery. He is supposed to have been buried under the bus stop at Cedar and Lake. “Uncle Wardell.” Is first mentioned in Isaac Atwater’s “History of Minneapolis” which was published in 1893. It said: “In 1855 or 1856 there was a death near Mr. Layman, and the family having no land and being poor, Mr. Layman gave him a corner (now Cedar and Lake*) for a burial place. And Uncle Wardell thus was thus the first person to be laid away there. There’s only one problem—Uncle Peter does not appear to have existed or, if he did, he was not buried in Layman’s Cemetery. And, the first burial was not at Cedar and Lake, it was at the opposite end of the cemetery closer to 21st Avenue. This headline from the Daily News was a fairly commonly held belief in Minneapolis during the early-to-mid twentieth century and contains two major errors. The “Indian massacres” that the reporter and headline writer were referring to was the Dakota Conflict of 1862. There are three casualties of the conflict buried in the cemetery—Philander Prescott, and two brothers, Lathrop and Sheperd Dickinson—a fact that was well established by the time the story was written. There are not 3,000 unidentified dead in the cemetery–there are 78 people whose names are not known and none of them were killed in “Indian massacres.” Most of the unnamed burials were transients or homeless men who were killed in accidents. The headline’s author assumed that the identities of the 2,990 people buried in the paupers’ section (Section H in the northeast corner) were unknown. That is not the case. They were poor and may, or may not, have had friends or family in the area. They are buried in the pauper’s section because no one could afford to buy graves for them so that they were buried at the expense of the county. A corollary to the idea that the names of those buried in the cemetery are unknown is the belief that the location of graves is unknown. The cemetery’s records are in remarkably good order for ones that date back to the middle of the 19th century. The Layman family kept close track of the sales of blocks of graves as well as the sale of individual graves. For many years the cemetery’s caretakers kept daily work logs. During the Depression, employees of the Works Progress Administration created a plat book, retyped burial cards, and conducted a marker survey. Graves for individuals can be identified despite the fact that so many of them are unmarked. Rest assured that we know who people were (or weren’t) and where they are buried. If you’re curious about the records, pay a visit to the office some time and look around.